This new generation of CPU coolers represents the culmination of Swiftech's efforts to offer upgradable AIO's that look and perform like custom kits, while preserving and improving upon the characteristics that have made AIO’s so popular today: reasonable cost, superior performance, plug-and-play functionalities, and no maintenance. •A fully redesigned patent-pending radiator/reservoir/pump combo featuring a large clear acrylic reservoir of tubular shape, and showing the inner workings of the system’s powerful pump. The large coolant reserve prolongs operations without maintenance well beyond the 3 year product warranty. •A new CPU waterblock, the Apogee™ XL2, which now features chrome plated copper base plate and a redesigned housing with enhanced flow characteristics for better hydraulic performance. The housing is made of clear acrylic material to visualize the coolant flow path, and to create fantastic color and light reflections thanks to an all-new system of RGB ALED lighting. The installation hardware has been enhanced for an even easier and trouble-free installation, and it is compatible with all current desktop processors from Intel and AMD. •The use of maintenance free Mayhem ultra-clear tubing, providing the overall custom looks and feel of the product. •The use of addressable RGB LED’s (ALED) lighting throughout the system: on the waterblock, reservoir, and radiator accent piece; addressable LED’s are the latest and greatest in the world of LED lighting, providing control over each individual LED for unparalleled possibilities in terms of lighting effects. •A new PWM splitter including the ALED lighting control button, allowing users to connect the system PWM devices (fans and pump), and to switch the LED’s to 7 different colors and 3 gradually increasing intensities; the device also includes connectivity to the chassis control panel, utilizing the ubiquitous reset button for instance to switch colors of the LED’s at will. •The inclusion of red, blue and green Mayhem color dyes, so users can customize their own color experience and give their system the finishing touch of their choice. From virtually silent to comfortable audible noise levels" Our design objective for all Swiftech products is always to minimize the operating noise while preserving high thermal performance characteristics. At its lowest speed settings, the H220 X2 system is virtually inaudible. At its maximum speed, it remains within comfortable audible noise levels. "Plug-and-Play" With pre-installed fans, and the new Apogee XL2 mounting system, the H220 X2 is probably the easiest AIO liquid cooling kit to install bar none, and is even easier to setup than many high-end air coolers. "Superior Thermal Performance" Thanks to its copper & brass dual 120mm radiator, high static pressure Helix 120mm fans, more powerful DC pump than any other AIO on the market, and because it uses the Award winning Apogee™ XL2 series waterblock, the H220 X2 kit delivers superior thermal performance to any comparably sized system on the market. The H220 X2 differentiates itself from other AIO's by its ability to be fully customized, and to support additional liquid cooled components such as graphics cards, chipset, and/or additional radiator(s). Enthusiast grade 5/8” OD (3/8" ID) clear PVC tubing fastened to swivel fittings with an elegant clamping system that users can easily remove and safely re-install. The factory fittings can be replaced by aftermarket G1/4 compatible offerings of the user's choice. The award winning flagship Apogee XL2 series waterblock. 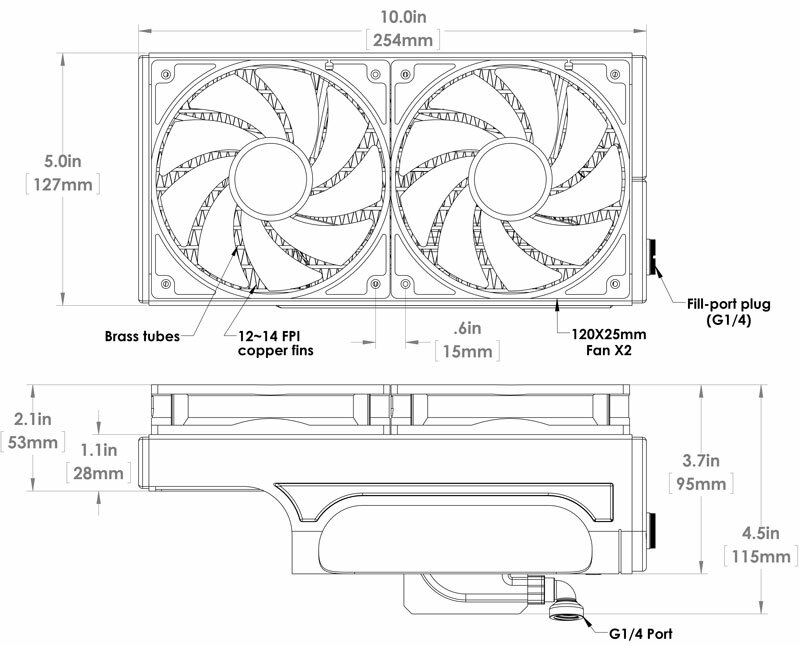 "Automatic speed and lighting control right out of the box" Speed control of fan and pump are PWM compliant, allowing the H220 X2 to be recognized and controlled by the motherboard depending on CPU temperature just like any standard CPU cooler. The system includes a PWM splitter allowing connection of up to 4 PWM devices (2 to 3 fans depending on model + the pump) which can then be controlled as one by the motherboard. For lighting control, the PWM splitter also includes 3 more connectors for the all new ALED lighting system, a two-pin connector that can be used for remote control (utilizing the mostly unused reset switch for instance), and finally a small button to change both colors and intensity of the LED's. "Maintenance-free" As shipped from our factory and installed as directed, the H220 X2 CPU cooler requires no maintenance during its 3 year warranty period. If upgraded by the user, the interval of time between refills will depend on how users implement their customized loop. The radiator can be installed horizontally or vertically - right side up or upside down in both configurations: in other words, horizontally with the pump/reservoir facing down (top of the case), horizontally with the pump/reservoir facing up (bottom of the case - * see important note below), vertically with the pump/reservoir at top (back of the case), vertically with the pump/reservoir at bottom (front of the case), or it can also be installed on the side. * Important note: when installed horizontally with the pump/reservoir facing up, the amount of space available for air trap is reduced, therefore necessitating to keep the reservoir always full of coolant, particularly at high pump speed, in order to avoid entrainment of air into the pump. Because of this limitation, the 3 year no-maintenance representation stated above cannot be ascertained in such configuration. "Support" With over 10 years of experience designing, manufacturing and setting up liquid cooling systems, Swiftech® customer service can assist you in setting up and troubleshooting your system 6 days a week, 12 hours a day. Hardware shutoff built-into the pump power wires. The hardware fail safe is only triggered in case of a firmware malfunction.